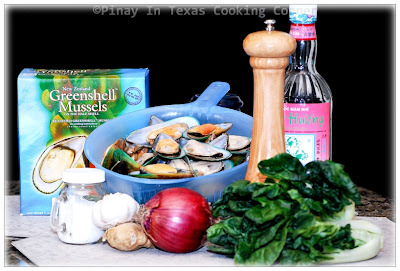 Tinola which is a ginger based soup, is an authentic Filipino dish that can be cooked with either meat or seafood. 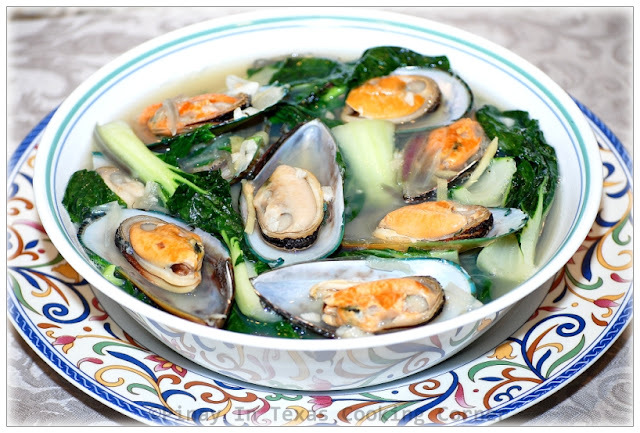 One of my favorite variations of it is the Tinolang Tahong or Mussels in Ginger Broth. This is a very nutritious and delicious soup that is basically made with mussels, garlic, onion, ginger and leafy greens like pechay, spinach, or chili leaves. In the Philippines, it is a favorite during rainy season. 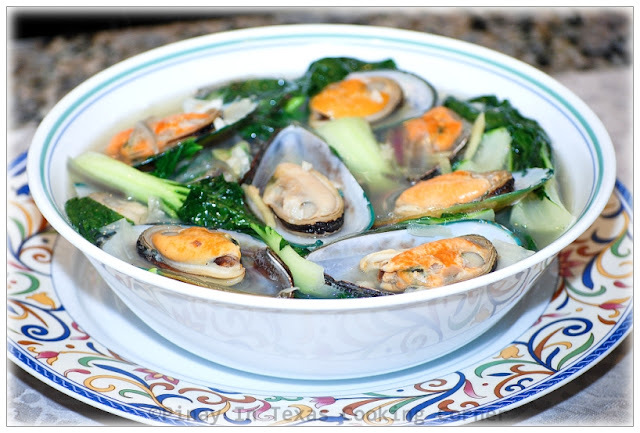 It is the simplest and inexpensive Pinoy way of cooking tahong that gives a very refreshing broth. I'm sure you will love it! 2 lbs shelled tahong (mussels) - I use boxed blanched half shelled mussels since fresh tahong isn’t available here. 1. If using fresh mussels, wash them and place in a bowl, cover with water and let sit for several hours to allow the mussels to expel dirt. Discard water, wash and drain. In my case, since I use boxed blanched half shelled mussels available in Oriental Stores, I just wash the mussels in running water then drain. 2. In a large saucepan over medium heat, sauté garlic, onion and ginger in oil. When the onion becomes translucent, add the mussels. Stir-fry for about two minutes or until the juice comes out. 3. Add water. Bring to a boil. Simmer until the tahong shells have all opened. Do not overcook the tahong! The meat will shrink if cooked for too long. Since I’m using blanched tahong, I only simmer for about 2 minutes. 4. Add fish sauce. Add salt and pepper to suit your taste. Add pechay and simmer until the pechay is cooked but still crisp. I simmer for less than 3 minutes.